It’s been great walking weather for weeks here--not too hot (but almost), not too cold, not too windy, a gorgeous blue sky, and more golden leaves every day. When I walk for exercise, I must have music or someone to chat with. But when I walk the dog in the morning, I like to hear what’s going on around me...cars in the street, high-schoolers on bikes, leaves skittering in the breeze, the wing beats of a bird flying overhead (are those ravens we have or giant crows?). We know good writers have a sharp eye for detail, but attentive listening is just as important for evoking vivid descriptions. And listening in on conversations helps in crafting realistic dialogue. Listening in…isn’t that eavesdropping? Yes. And…not so much. Thanks to cell phones, we talk more in public than ever before, and what was once a clandestine activity is now part of our culture. (If you doubt this, Google “overheard in” and see what comes up.) Granted, cell phone conversations are one-sided, but that sometimes makes them more fun, as we have to imagine/infer what the unseen person might be saying. A recent project in the UK explored the creative potential of listening in. Writers were asked to collectively eavesdrop on July 1 and then to write something –a poem, short story, flash fiction, or a 5-minute-long script—based on what they’d heard. 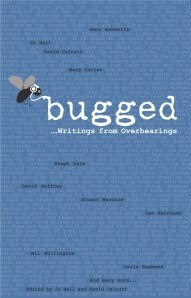 The organizers’ goal was to "bring writers out of their sweaty garrets and into the streets and coffee houses" and "raise issues of privacy and creativity.” The result is the book bugged – Writings from Overhearings, which launches in the UK this week. I thought it would be fun to try something similar on The Writing Bug. For the next two weeks, keep your ears open when you venture out of (whatever serves as) your sweaty writer’s garret. Instead of tuning out the annoying person yakking in the grocery line, pay attention. Write it down. (Be discreet, though. No need to get anyone riled up.) We’ll meet back here on October 25, hopefully to report the humorous, poignant, embarrassing , cryptic, or flat-out outrageous things we were lucky enough to overhear, and whether or not they provided any creative inspiration. I hope you’ll join in. Happy listening! What a great idea! Sweaty garrets indeed. I'm already terrible about paying more attention to other people's conversations than my own when in crowded places. Makes me a real joy to go out with. This is wonderful. Count me in! Sounds interesting and fun! I'm in! Count me in! I sit in the smoking area at work and read or write on my breaks. Most people think that I am tuned out to their conversations, and sometimes, I am. But now I'm going to pay more attention. Many of the things said may be priceless from a writers perspective.